Carpools are very useful arrangements for busy parents. But there's a bit more to a carpool than just alternating driving days. Being part of a carpool implies a commitment both on your end and on the other moms'. 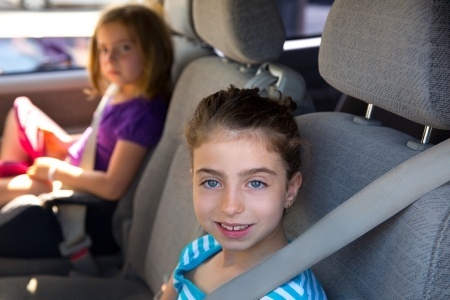 If you work these 8 carpool rules for kids out ahead of time, it's easier to address problems when they happen - and to keep the mutually beneficial arrangement in place. The car cannot run unless seat belts are fastened. (I actually had my daughter convinced this was true until she was about 7). Make sure all your carpoolers are buckled up for safety. If you have a passenger-side airbag, of course. If yours has been disabled or you have an older-model car, check with the kids' parents first. Never assume because an eligible kid wants to ride in front that his parents would agree with his decision. Adjust this rule as you see fit. Or not. On the fence on this one? See Dashboard Dining: Yes or No? for food for thought. All body parts must stay inside the car at all times. This one needs no further explanation. No loud voices or yelling inside the car. Distracting the driver is always a no-no. No touching anyone else. (See rule #5). Mom gets to choose the radio station or music, If any, of course. She's the driver, after all. And good music can keep you sane. As our kids might say: "Duh."